Got a Large PPS H/O or pressurized cup with lids and liners after getting a mini yesterday. This is sort-of a continuation of this thread which went way off topic into 3m PPS. I wasn't expecting the clearance problem with the large cup with the Gxpc. As one can see in the picture, it won't clear the hanging hook and the it won't even clear the trigger when rotated the other way. I had hoped I'd be able to rotate it back further for better balance. Not sure if I should return it or just live with its restrictions. A midi size or 13.5oz would have been a happy medium but they don't make a H/O cup. That would allow only a small amount more rotation before hitting again. I've used that hook while working off a ladder so I could back brush some cedar after I applied stain so it's worth having. I do have to make standing fixture like you have there. Mine came with the aluminum gun holder to mount on the turbine but I attached it to a board and clamp wherever I want. I see Tom has the same problem! I don't consider it a problem. You wouldn't rotate the cup if you could? Don't you rotate the mini cup or maybe you never have the need to? I'll see how a filled cup feels. I do have two Fuji Gxpc guns so removing the hook is a possibility. I have a better idea! I couldn't remember if both threads on the so-called G-fluid coupler are SAE. They are so I'll make another one about an inch longer which will clear everything. Since that throws the weight outwards, if that becomes a problem I'll just shorten it to a happy balance. I use the smaller PPS cup on my Gxpc and the larger cup on my syphon xpc. Unless you need to fit into tight areas, there is no need to rotate the cups into different positions. PPS cups can be sprayed while upside down because there is always pressure on the paint bag. Rotating a large cup on a Gxpc might improve the balance. See reply where one cut the hook off for that purpose. I never stated to rotate the cup. That's on of the best things about the PPS system, it allows you to spray in any position------rotate the gun as necessary. Personally I think a 28-32oz PPS cup on a gravity gun is excessive. There's a reason the original Fuji cup was only 400ml. Agreed. For me it's just too awkward to handle. To each his own however. The larger cup on the siphon gun works perfectly well. 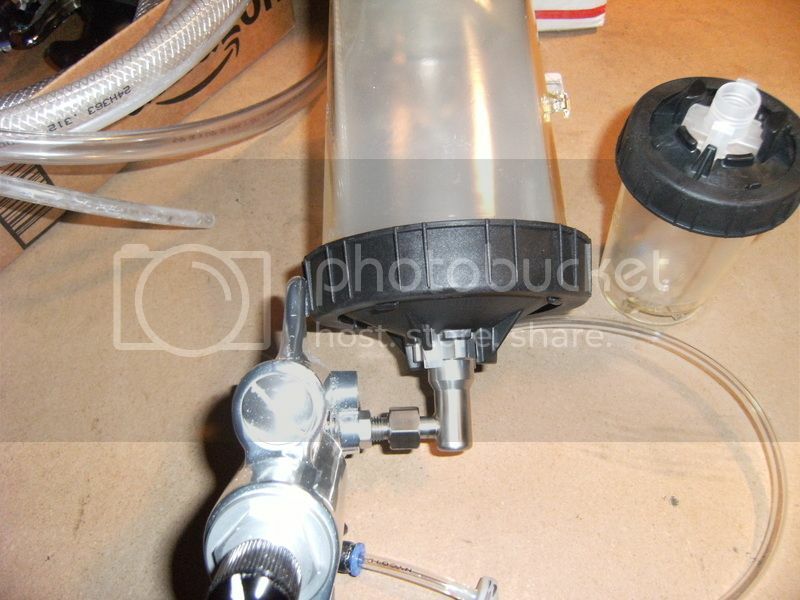 No talking about a siphon gun but a Gxpc with a side mount cup. Yeah, you can spray in any gun position but this is about the position of the cup in relationship to one's wrist. It's seems to me that the closer the cup's weight is to one's wrist the easier it'll be on the wrist. Pushing eight years of free weights usage twice a week. Stair climber/Health Rider and stationary bike/Health Rider on separate days is enough for me. I don't have the time for the treadmill lately. I'm good with being just a feeble old man. Geez, I'm older than you! Fluid coupler extension. Just have to test with water under pressure for leaks. I can feel the difference even with an empty cup from rotated forward if used on a horizontal surface. Made out 303 stainless steel. Added the "tjbnwi" pressure tube mod also which should help bleed air from the large PPS cup is used for smaller amounts by shutting off the air flow to the Gxpc. Trial by water today and that pressure tube mod really speeds up forcing air from the PPS liner!! It was well worth the effort. Make sure you adjust fluid delivery. In this thread or elsewhere, didn't you state that the HO PPS pressure don't hold their pressure? I noticed this today using the mini(6oz) cup with water to clean my Gxpc. It leaks around the top at the rotating locking collar. Tried another lid/cup, same thing so I tried the large cup and it leak as well. Yes, but nobody believed me. I'm prone to finding air leaks lately so I wasn't if I was having found yet another one!